“Our enormously productive economy demands that we make consumption a way of life, that we convert the buying and use of goods into rituals, that we seek our spiritual satisfactions in consumption. We need things consumed, burned up, worn out, replaced and discarded at an ever growing rate.” American Marketing Consultant Victor Lebow, 1955. 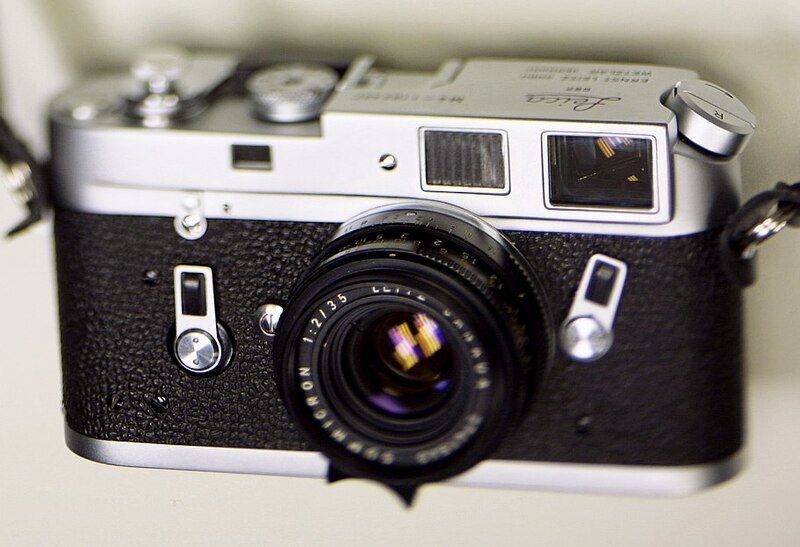 Ironic that this quote coincides with the age of the iconic mechanical Leica camera, the M3. The M3, produced by Leitz between 1954 and1966, is the product of a Leitz corporate culture at odds with the prevalent business ethos; A Leitz culture that valued quality and durability, costly as an initial consumer outlay, no doubt, but prudent when viewed in the context of the product’s productive lifespan, and for Leitz, at the expense of accelerated improvement cycles. As the marketeer quoted above noted already in 1955, speed of product decay has become a corporate good; durability a hinderance to the cultivation of new consumer appetites. The idea of consumer progress and corporate profits depends on rejecting as valueless what has come before, corporations constantly repudiating what they had only recently proclaimed. And thus, through advertising, the constant thought shaping of a desire for the newer, the improved, which leads to the consumer’s preoccupation with the next purchase, always chasing future happiness through the a delusive pursuit of something “better.” Of course, this is the big lie that is the necessary premise of the whole philosophy of consumerism. What you desire is always just out of reach, and you will only have what you want with the next purchase. Anything that is “old,” outdated, last year’s model, is inferior, of no note, no value. And, like good sheep, consumers that we have been programmed to be, we buy it. Thus, you see talk on any camera forum about 2 year old cameras as being “obsolete” and can observe the neurotic buying and selling amongst the denizens there, chasing the new and improved with the constancy of a metronome. As a general rule, I think that the CLA (“clean, lubricate, adjust”) culture surrounding ownership of mechanical Leicas is crazy. People having their cameras pulled apart and “cleaned and lubricated” every few years is completely unnecessary and, frankly, deeply neurotic. Most Leicas, even shelf queens without much use for long periods of time, will gradually loosen up with use – wind-on will become smoother, lower speeds will free up and become consistent with exercise. 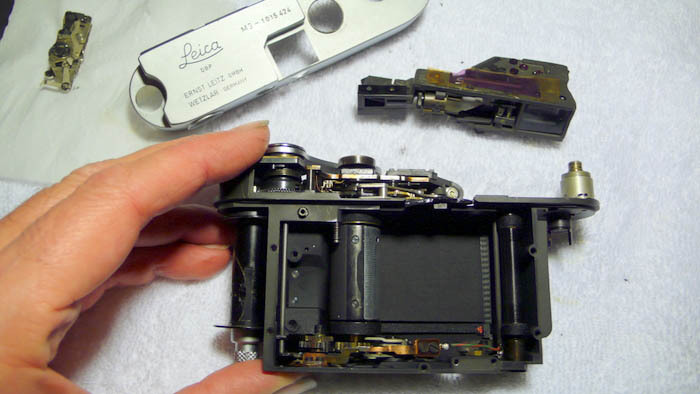 Dismantling a camera to deal with these issues invites the potential for as much harm as good. As a general rule, if its not broke, don’t fix it. Of course, if viewfinders are hazy, or rangefinders need alignment or re-silvering, by all means do so. That being said, from a philosophical perspective, I applaud the idea of fixing a serviceable tool like a mechanical camera as opposed to retiring it for something newer. Fixing things, as opposed to upgrading, can be an act of protest, a thoughtful subversion of the mindless consumerism demanded by an always accelerating economy whose logic insists that the only proper response is to replace what you have with the newer and “improved,” and, of course, to pay exorbitantly for the privilege of doing so. This, and this only, is what drives profits for camera companies. But keeping things and fixing them is both a a financial remedy and a philosophical stance. Ownership of a finely made tool can be something we see within a larger context, a trust almost. It can take on a certain moral quality that can deepen the joys of owning something finely made, and made for long use. While we as owners benefit from the investment in well-made, purposeful tools, it creates a financial conundrum for manufacturers of quality like Leica. It is, in reality, a corporate ethos at odds with market necessities. And thus we see the necessary gimmicks Leica employs to stay solvent, because a 50 year old M4, a tool manufactured and sold by them generations ago, properly maintained, is as functional today as the day it was produced. In almost all respects, it is the better of the cameras being produced today by Leica, even those, like the MP, which presume to maintain the leica’s mechanical heritage, given that they have been incrementally dumbed down in the course of modern updating and reduced quality components. Why buy a $4500 MP when you can buy a beautiful, fully functional M4 for a fifth of the price? This entry was posted in Leica, Leica Film camera, Leica History and tagged Leica CLA on March 21, 2015 by Leicaphila.